THE two powerful men in Nigeria are known. So are the two women behind them. What the world may have glossed over, however, is the weight they throw behind their husbands. The 2019 presidential election has been won, but the credit belongs to the women as much as it does to the men. 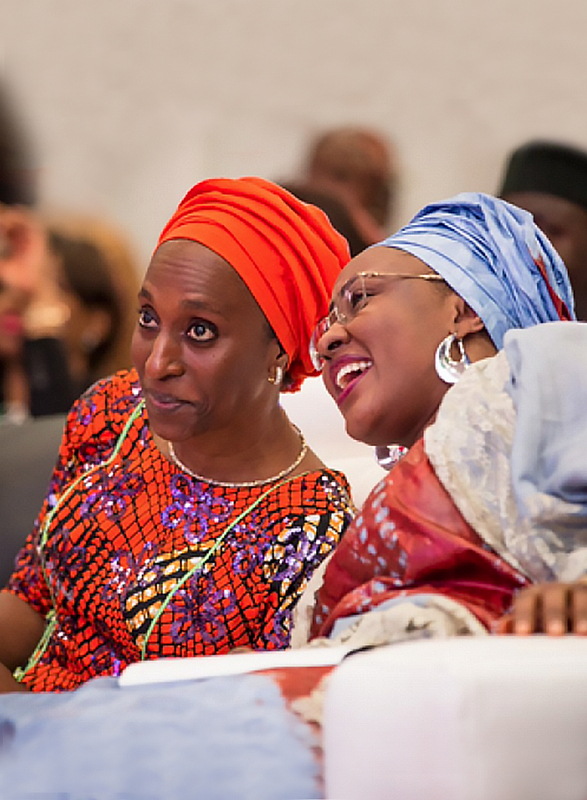 Unlike the frosty relationship that existed between Turai Yar’Adua and Patience Jonathan, Aisha Buhari and Dolapo Osinbajo seem to have bonded so well that they are more like sisters. So, no matter your political differences one may have with their husbands, hardly anyone can help but admire these pretty women of Aso Rock. During his electioneering campaigns in 2015, President Muhammadu Buhari assured Nigerians that if elected president, he would abolish the office of the First Lady. He said his decision was premised on the fact that there’s no such office of First Lady in the Nigerian constitution, just as there is no official role for presidents’ wives. Rather, he said ministries, which are constitutional, should be allowed to play their roles. “There is the Ministry of Women Affairs, and so on,” Buhari had said. Though not constitutionally recognised, the office of First lady had been maintained by past administrations and is even seen as a key influencer of policy decisions. A typical example was Patience Jonathan. She was not just powerful, but also provided comic relief for most Nigerians. And for her husband’s failed re-election, she covered more miles than many others. 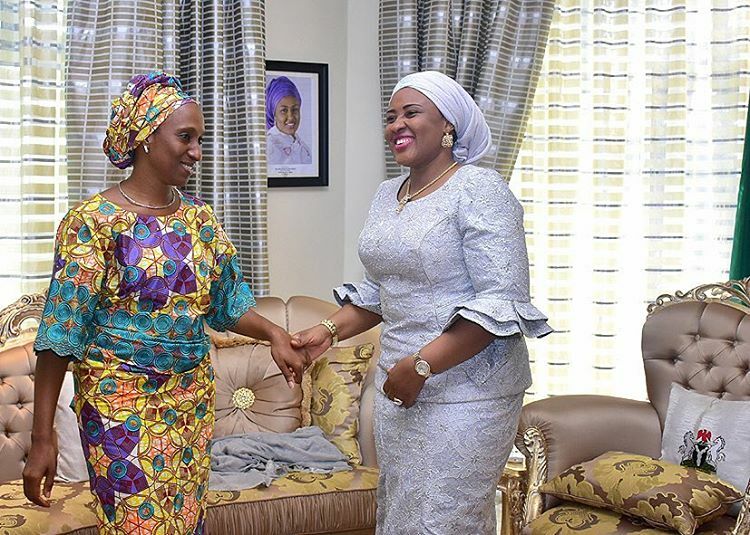 Aisha is not the usual First Lady only draped in ceremonial attires to attend official engagements and represent her husband at social functions. Right from the onset, this very confident and vociferous wife of the President gave a different definition to the meaning of the Office of the First Lady. Aside from standing up on several occasions, to voice her candid opinion and register her dissatisfaction with the state of affairs in the country, Aisha has been major critic of her husband’s administration. Whether granting interviews on radio, speaking at public functions or even posting her regular tweets on social media, the Adamawa State-born beautician, like an activist seeking a change to the status quo, has never failed to point accusing fingers at those she felt are cogs in the wheel of progress of her husband’s efforts at fulfilling his electoral promises to Nigerians. She continued: “Knowing what we have campaigned for, only for us to bring people that are busy saying that they are not politicians but they are occupying seats that were brought in by politicians. This is a huge disrespect for politicians. Knowing that we are just starting, we have not got to 2017, let alone 2018 and then 2019 for us to go back to the polls; you understand what I mean,” she lamented. At the National Women Leadership Summit organised by a group, Project 4+4, which was seeking support for the just concluded re-election of President Muhammadu Buhari and Vice President Yemi Osinbajo at the National Women Development Centre, Abuja, Aisha Buhari opened up again, this time, accusing two men of holding the government down. “If not for the two powerful men, Buhari’s achievements in the last three and a half years would have been accomplished in one year. The two people in government would never allow things to move fast,” she said. Obviously aware that her utterances might not go down well with guests, which included some top government functionaries, she quickly added, “I have realised that Senator Babafemi Ojodu, Special Adviser on Political Matters to the President, and Dr. Hajo Sani, my aide, and wife of the Vice President, Mrs. Osinbajo, are not comfortable with me saying this and want me to confine myself to my prepared speech, but we must say the truth,” the First Lady declared. The president’s wife, who did not disclose the names of the men in question, said she was dismayed at the disposition of some Nigerians who, rather than fight the two, crawl to them at night to curry favour. She, however, urged women to vote massively and return the APC to power and encouraged them to spread the news of accomplishments by the government and commended the political group for organising the summit and setting the tone for other Buhari support groups. It would be recalled that the First lady had earlier threatened not to campaign for her husband’s re-election if things continued the way they were before 2019. But President Buhari laughed off his wife Aisha’s comment, saying with infectious humour, his wife, the First Lady, belonged only in his kitchen and that he knew not which party she belonged to. Buhari’s comments to reporters in Germany prompted German Chancellor Angela Merkel, standing by his side, to give him a sharp glare that must have appeased feminists before she then laughed. But with Aisha’s December 4, 2018, revelation, it became obvious that she had changed her mind to back her husband in his reelection campaign, still not without standing up to the unseen hands, which she described as clogs in the wheels of the Buhari presidency. For her efforts towards ensuring good health for women and children and her firmness in ensuring justice and equity, the First Lady was given Personality of the Year by a newspaper. Though she didn’t attend the ceremony in person, Aisha seized the opportunity to make her voice heard once again. “One of the reasons adduced for honouring me was the interview I granted, which some people saw as criticism to a government that I am part of. I need to state that my position was a result of my sense of justice and not confrontation or disrespect. I was brought up to stand by the truth and this is how I have always been. As we are all aware, Nigerians elected this administration based on the trust and confidence they have in my husband. I, therefore, feel that we are here to serve Nigeria to the best of our ability. Let me use this opportunity to state that I support my husband in this call to service and will continue to do so,” she said. Described as one of the most beautiful wives of presidents in Africa, Aisha’s beauty is illuminating. However, she’s not just all about beauty; she belongs to the class of women with both beauty and brains. She holds a master’s degree in International Affairs and Strategic Studies, plus a couple of Post-Graduate Diplomas in Cosmetology. She equally has a book on beauty therapy. Beyond the brain and beauty is her polite and genteel nature that has drawn her to many. She has a provocative politeness that fittingly says much about the educated Nigerian woman. So far, courage and boldness have defined her personality. She speaks truth to power not minding whose ox is gored. She has consistently been a voice for “checks and balance” within the political configuration of the ruling party, the All Progressives Congress (APC). In fact, she was the biggest critic of the recent APC primaries across the country that brought about cracks in the party. “It is disheartening to note that some aspirants used their hard earned money to purchase nomination forms, got screened, cleared and campaigned vigorously yet found their names omitted on Election Day, these forms were bought at exorbitant prices. Many others contested and yet had their result delayed. Fully knowing that automatic tickets have been given to other people. All Progressives Congress (APC) being a party whose cardinal principle is change and headed by a comrade/activist whose main concern is for the common man, yet, such impunity could take place under its watch,” she said. Aisha’s outburst has a long history with this administration. Right from its threshold, she has distinguished herself as the “fearless fighter” ensuring that the APC-led Federal Government delivers on its campaign promises to the people. She was first to criticize the party over the allegation of reneging on its campaign promises. Precisely, it was in November 2015 when some officials of the party and the government began to sing different tunes as regards the campaign promise of paying monthly stipend of N5000 to 25 millions poor Nigerians. Aisha then directed her media office to issue a public statement calling on the APC not to renege on its promises to the people. Eventually, the Federal Government created the Social Intervention Fund, voting N500 billion in the 2016 budget for the programme. Her intervention seemed to have paid off as hundreds of thousands of Nigerians have, so far, benefitted from TraderMoni, a micro-credit scheme which is part of the Government Enterprise and Empowerment Programme (GEEP) designed to assist petty traders across the country expand their trade through the provision of collateral-and interest-free loans from N10,000. The loans are repayable over a period of six months. The scheme, which opposition has tagged ‘sophisticated vote-buying’, has been launched in 33 states and the Federal Capital Territory (FCT) with over 809,000 Nigerians as beneficiaries. During the medical vacation of the President that lasted for several months in London, Mrs. Buhari had battles with the so-called “cabal” in control of the administration. Also, Mrs Buhari, on Monday, October 9, 2017, condemned the management of Aso Rock Clinic, adding that the health centre didn’t have the facilities to treat patients. According to her, she had to visit a private clinic after she found out the Aso Rock clinic’s X-Ray machine was not working. She has been consistent in warning politicians against politicising the issue of women empowerment. Meanwhile, her intervention has not been limited to politics as she has remained loud in advocating better focus on health and children issues, especially, the increased adolescent health information for AIDS control. Lamenting the high number of HIV patients in Nigeria and other African countries, Mrs. Buhari said the only way to curb HIV/AIDS is by including health education for young people, as HIV has become a global public health issue. On her part, wife of the Vice President, Dolapo Osinbanjo has a warm and charming character, which has made her an enigma and one of the most inspiring personalities in Nigeria. 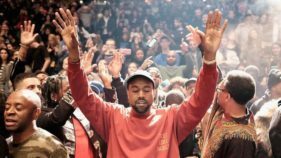 Extremely humble unlike most women in her position, who would prefer to be in the front, even seemingly contesting the limelight, this pastor’s wife prefers to be in the background; she a team player. This also explains why she has bonded so well the first lady. 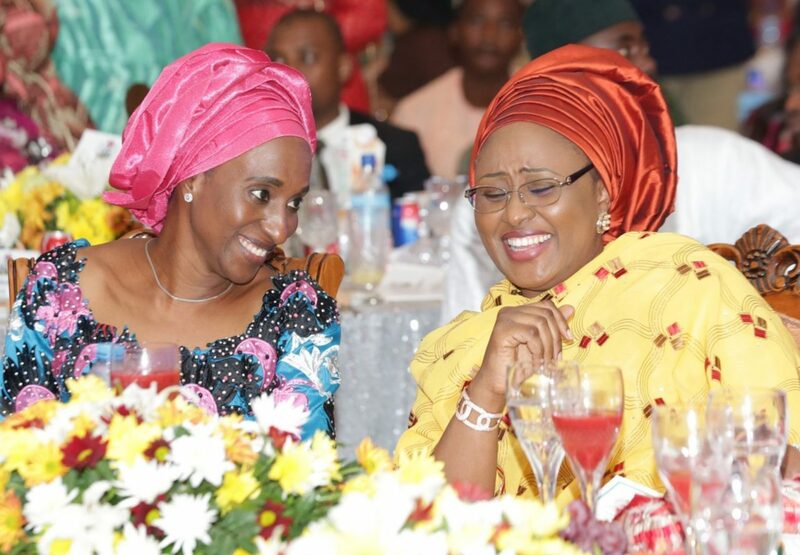 To Dolapo Osinbajo, Aisha Buhari is more like a sister and the relationship is very cordial. That iconic picture of Dolapo Osinbajo helping Aisha tie her gele, which trended online, remained indeed an illustration of the closeness between both women. “I am very happy each time she (Aisha) calls me her sister. Mrs Aisha Buhari is a very warm and joyful woman. It is very easy to form a bond with her. Her two topics of discussion are Nigeria and Nigerians. And so we have a common area in which we are both interested and involved,” she said. “It does not matter that we speak different languages, come from different parts of the nation, practice different faiths, have different careers; we truly enjoy one another’s company and by the grace of God care for one another,” she noted. A grand-daughter of late Obafemi Awolowo, the First Premier of the Western Region, Dolapo’s mother was Ayo Soyode, the now deceased older sister of the more well-known Tokunbo Awolowo-Dosunmu. A qualified lawyer and a writer, who has written many books including the popular book, They Call Me Mama!, which chronicles her experiences interacting with and reforming street boys in Lagos Island. She has assisted in several projects, which helps to develop the lives of women and children. Like Aisha Buhari, who would say things the way they are, Dolapo is no less opinionated but certainly more diplomatic with her public comments. Her legal background may be a factor. “I don’t think I am in the best position to answer that. But I think he is the best man in the whole world. One thing I can say is that we have been married for the past 25 years and every day, I get to respect him the more. He is very kind and lovely. I have never met a man more caring than he is. He is the most caring person I have met,” she enthused. “It is time for mothers that are here to admonish our children not to be used as instruments of violence for politicians. Politicians can fight with each other and at the same time become friends. If you take side and get yourself killed, you will have yourself to be blamed for the loss.” Even when she spoke about accountability in government, it was with utmost discretion. Certainly, Aisha Buhari and Dolapo Osinbajo were instrumental to 4+4 movement. With the second term mandate now in the kitty, Nigerians are waiting to see how the women of ‘Aso Rock’ would shape the events in the next four years.